PHOENIX, November 16, 2009 – It’s said that preparation can make all the difference in challenging endeavors, and Joe Bacal and his JTGrey Racing Team have taken the idea straight to heart for the 42nd running of the Tecate SCORE Baja 1000—the toughest and most prestigious off-road race in the U.S.—set to start this Friday morning. Sponsored by Cancer Treatment Centers of America, Bacal began his rookie off-road racing season in June of this year with a remarkable victory in the Baja 500. He followed with a solid second-place finish at the Primm 300 in the new-to-racing Lexus LX 570 that, much like Hodgkin’s Lymphoma survivor Bacal, has proven durable and unrelenting. 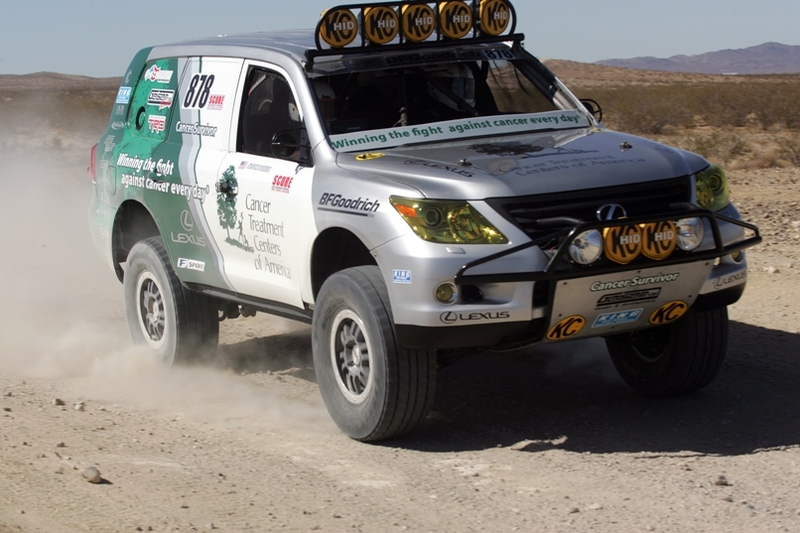 But Bacal knew there was more potential in the Stock Full-class Lexus to make it quicker and easier to drive in rough terrain, so the team spent useful time between races testing and developing various components with their eye on conquering Baja. Bacal also wanted an experienced Baja co-pilot at his side and so hired expert navigator Gerald (Smitty) King to guide him on the notorious race course. King is a veteran in the ultra-quick trophy trucks and is often requested by top desert racers. By virtue of his Baja 500 victory and Primm 300 podium, Bacal heads into the Baja 1000 second in points in SCORE’s Stock Full class with a legitimate shot at winning the 2009 championship. Bacal has also earned a “Rookie of the Year” nomination on SCORE’s “2009 Off-Roadsman of the Year” ballot. This year’s Tecate SCORE Baja 1000 will start at 6:30 a.m. EST on Friday, November 20 from Ensenada. NBC Sports will cover the event, currently scheduled to air on December 19 at 2:00 p.m. ET. For more information and updates on Joe Bacal, visit www.controlamidchaos.com.